We are excited to announce that we have 3 individuals certified in the LSVT BIG Program. 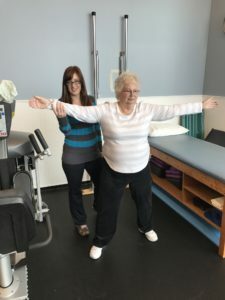 LSVT BIG is a standardized treatment protocol program designed for the treatment of Parkinson disease, which is customized to the unique goals of each patient including both fine and gross motor skills. LSVT BIG can be adapted or progressed in order to meet each patients needs across a range of disease severity and presenting impairments. Please stop in or call us at 231-873-3577 or send us a message to find out more about how out therapy services can help to achieve your maximum functional mobility.